Congregation Beth Israel, one of the oldest synagogues in Western Washington, has served Bellingham’s Jewish community since its establishment in 1908. Founded primarily by Lithuanian immigrants coming to the shores of the far western United States, the congregation moved into the synagogue building at the corner of Broadway and Irving in 1925. We moved into our new building at 751 San Juan Boulevard in March 2018. Although originally founded along Orthodox traditions, with men seated in the main sanctuary while women worshipped from the balcony, the congregation became more liberal after World War II. Further liberalization occurred over the next 30 years. In 1987, Beth Israel affiliated with the Union for Reform Judaism (then called the Union of American Hebrew Congregations). Read more about the history of Beth Israel. Our members come from all walks of life and from a large region encompassing not only Bellingham and Whatcom County, but extending from the lower mainland of British Columbia to Mount Vernon and Skagit County as well as Island and San Juan Counties. Many are also newly arrived in the Pacific Northwest from other areas of the country. Beth Israel strives to accommodate the growth and diversity of its membership, providing worship and study which is both meaningful and comfortable to Jews from a wide variety of backgrounds. CBI is a diverse and inclusive synagogue affiliated with the Union for Reform Judaism and committed to a tradition that honors both Jewish continuity and innovation. We warmly welcome people into our vibrant community, dedicated to the study of Torah and creative Jewish learning, joyous and meaningful worship, and engaging in the sacred obligation of tikkun olam, repair of the world. As inheritors of a rich past and creators of a future full of possibility, we continually seek new opportunities to support each other in participating and growing Jewishly. 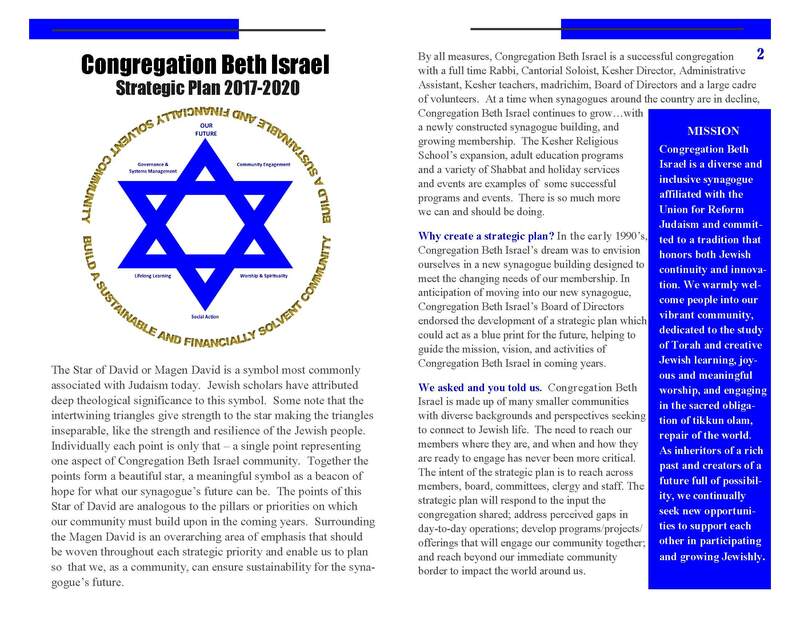 Beth Israel’s Strategic Planning committee has worked hard to put together a plan for the future. Click on the image to download the plan for 2017-2020.